Simply flip bed inside out for a new look! Great for older dogs - any dog! Open front design makes easy to step into this Bowsers bed. 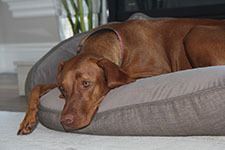 The oval design creates a feeling of security dogs love and they'll rest their heads on the supersoft bolster. Zippered cover for washing; tufted bottom ensures fiber doesn't clump. Reversible design with attractive coordinating bottom color & piping. To Clean: Unzip cover and remove inner bolster. Rezip cover, machine wash cover with attached bottom cushion as is on cool cycle. Tumble dry, cool setting. Custom Fabric: Please contact customer service for more information. It takes 4-6 weeks for a custom bed. 32" x 25" x 7"
36" x 27" x 7"
45" x 32" x 8"
NOTE: Linen & Jacquard fabrics have a coordinating microvelvet on the base. All microvelvets have a coordinating microvelvet & trim. The fabric combination are described in the pull down color menu.Two beds in one! Contact customer service if you have any fabric combination questions. Custom Work: Bowsers can make a bed that isn't a stock color, you can choose from their list of fabrics. Please contact customer service for more information, there is an upcharge for this work and it takes 4-6 weeks for a custom bed.